Constantin Brancusi Sculpture Authentication - Identification Brancusi's Fakes & Forgeries, fake investment scams - Sculptures | Forged certificates of authenticity and documentation | Expert Investigations of Brancusi and Brancusi Art fraud. * Before entering into a full investigation of the legitimacy of a work of art that may possibly be by Constantin Brancusi, be it academic, forensic or as with most cases, both forms of scrutiny, it is essential to know if the project is viable and in the final analysis, provable. Much the same as you would need to be reassured if you were taking a legal case to court. Logically, if it is not viable, you should not attempt it as the risk of failure is too high. So we pre fer to make a preliminary and vital professional pre authentication assessment for clients first. This is based upon the images you supply, the details and the items history. *Many small fake stone sculptures have emanated in recent years from Romania itself. Always supported by copious amounts of professional looking authenticity documentation, believable academic theoretics and highly inventive provenances put together by a hitherto self proclaimed expert in support of the authenticity of the piece. *Both the documents and the stories are totally fabricated lies. Do beware ! A highly successful Italian based attempt at selling Brancusi forgeries in North America is underway with seven fake sculptures recently bought by a Canadian consortium of investors who wrongly believed them to be authentic. Now asecond Italian based Brancusi art fraud has been brought to our attention within the last few months, supported by the same type of fake COA's - authenticity documentation and credible but completely false stories and histories. Historically, Constantin Brancusi was a Romanian abstract sculptor and one of the most dynamic and revolutionary sculptors to emerge in the 20th century, with some fine art commentators and art critics proclaiming that Constantin Brancusi was frankly the best ever. But note well. Alongside Auguste Rodin, Constantin Brancusi happens to be one of the most faked sculptors in the world. In just over a year, Freemanart have been instructed to investigate no less than twelve separate incidents where fake or forged sculptures believed to be by Constantin Brancusi have been passed off as original Brancusi works in major art fraud attempts in North America, Canada particularly... and in Europe. The 13th fake Brancusi issue landed on our desk this week, Another case, currently operational in Romania is pending, so there is a real and current problem with Brancusi fakes abounding. Clearly with more to come. All of the Brancusi sculptures we have investigated to date have proved to be illicit forgeries and fakes yet were supported by copious amounts of what was believed to be positive authentication documentation from the once powerful and believed to be spotless Brancusi scholar. A Romanian who was the all knowing and determining expert on Brancusi's works. Now discredited and exposed as a charlatan and believed to be behind the whole re emergence of what are proving to be fakes, the true extent of the international Brancusi fake scam may never be known. Interestingly, apart form obvious Romanian connections, Germany and now Italy recently come into play with the supply of fake Constantin Brancusi sculptures. WARNING: Beware of small, crudely produced river stone carvings with similarities to Brancusi's style, always passed off and usually with remarkably believable stories of how trustworthily they were obtained back in the 'homeland' by someone from the family who knew Brancusi personally! 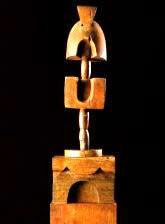 Remember too that Brancusi was exquisite in his creation of sculptural line, form and rhythm. Technically, his work is remarkable. 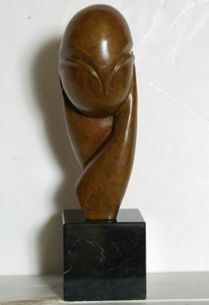 So if the Brancusi sculpture you are looking at is in any way crude.....leave it and walk away or come to us for advice. Firstly: Approach a respectable company or business man with the proposition to front a loan against the collateral of a Constantin Brancusi work of art. Usually small pieces, fully authenticated on paper by 'the' so called expert, with the promise of buying it back or settling a purchase deal and it seems pretty sound. Brancusi river stone works are a favourite ploy, the accompanying story being that they are part of a group of very early works by Brancusi only recently discovered in a village where he worked as a young man. Beware when the opportunity of a lifetime comes along when you are offered by a broker a share or the option to buy outright, any small Constantin Brancusi sculpture work which is fully authenticated by the ultimate expert on Brancusi and supported and yes you guessed it, recently - yet magically found in Brancusi's village where he worked as a student of the arts deep in Romania. There are lots of reasons to keep the deal hush - hush. Including avoiding the export duty of the sculpture from Romania itself, or the import duty into North America or Canada or another EU country, or simply avoiding the death duties which may be payable by the widow of it's previous owner who the art dealer is trying to help out! What a nice guy he is...! It's always the same modus though, it's complete rubbish and a downright filthy scam! We know of two buisiness investors who were caught in this way and believed every word, and another, a very elderly lady in Canada who put all she had into the deal and waved goodbye to all of her savings. We are proud to specialise in identification and authentication investigations into Constantin Brancusi fakes, Brancusi fake sculptures and in the confidential pursuit and prosecution of Constantin Brancusi art fraud internationally. *You are most welcome to Contact Us in the strictest of confidence at any time. Another fake Brancusi case goes back much much further and implicates people 'close to' the sculptor himself and exactly the same Brancusi expert again, this time ower in Bucharest. Back in Romania, a suggestion of a good long term Brancusi 'safe investment' was made to the purchaser of a small marble sculpture believed to be by Brancusi and supported with firm, absolutely watertight documentation from our nameless, but shameless expert. We are talking of hundreds of thousands of dollars in financial investment here and the work following the deal then transits to North America where years and years later the problem of Brancusi authenticity rears its ugly head, big time. I am afraid the advise is obvious. If it seems too good to be true and you are offered a cheap Brancusi it probably is too good to be true. 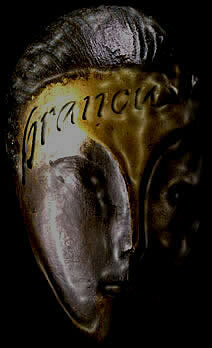 There are no cheap Brancusi's! Constantin Brancusi's works fetch prices up in the millions today, so if it's too cheap then its either wrong and a fake or stolen! Constantin Brancusi, Portrait de Mme L.R. (1914-17) sculpture in wood, sold at Christie's, Paris - $37.1 million. *Sadly Freemanart are unable and somewhat reluctant, rather than unwilling to show you images of the Constantin Brancusi forgeries and fakes we have discovered, neither can we divulge the name the names of the people involved with the frauds, scams and fakery. This is because of the international laws of liable and confidentiality protecting them! Surely this is the wrong way around ? On top of the works of art purportedly by Brancusi which have been fabricated and faked back in Romania, other fakers of greater international standing and notoriety have surfaced in recent years.. Guy Hain on the other hand, a Frenchman who went inside for his massive fraud worth $60 million was up to his eyeballs in dodgy - doings when 2,500 moulds and models for bronzes were seized from his studio and confiscated by police. It is believed that up to 4,000 works of art found their way onto the art market via art dealers and auction houses. Granted, they were not all Brancusi's. A good spread of other bronze forgeries however were evident from other artists such as Jean Arp, Carpeaux, Barye and Alberto Giacometti whose works, like Brancusi's fetch millions today. Remember that Brancusi sculptures similar to this are commercial replicas and not the real Mc Coy! Available on line with a starting bid of $2,500 and an auction estimate of $6,500 - $7,500, it's missing a couple of zero's to be real! 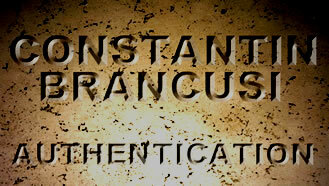 Brancusi authentication page header: Constantin Brancusi Sculpture Authentication - Brancusi's Fakes & fake Sculptures | Forged authenticity documentation | Expert Investigations of Brancusi art fraud. Description: Constantin Brancusi Sculpture Authentication Experts - Brancusi Fake Sculptures , forged Brancusi certificate of authenticity and fake Brancusi authenticity documentation, Forensic Investigations into art fraud.